These rules were amended by motion approved at the Annual General Meetingheld on 31st March 2008 and were registered with the Register of Incorporated Societies, Auckland on 4th April 2008. 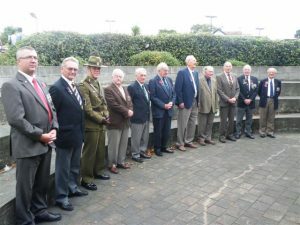 THE name of the Association shall be the Whangarei Boys’ High School Old Boys’ Association (Incorporated) “the Association”. (vi) Promote the establishment of branches of the Association and to liaise with and assist in the administration of such branches. (vii) To raise funds in whatever way the Executive Committee considers appropriate and to oversee the expenditure of these funds in the furtherance of these primary and ancillary objects and for those projects and objects for which the School (through its elected Board) makes application to the Association. a) Life Members shall be Members who are elected as such on the recommendation of the Executive Committee and by majority vote at a General Meeting of the Association. They shall not be liable for any subscription. b) Honorary Members are any person other than an Old Boy who is elected an Honorary Member on the recommendation of the Executive Committee and by majority vote of a General Meeting of the Association. They shall not be liable for any subscription but are not allowed to vote at any General Meeting of the Association. c) Members who shall be Old Boys who have paid, or pay, either a single lifetime subscription or an annual subscription of such amount to be determined by the Executive Committee. (iv) Annual subscriptions shall be payable on the date fixed by the executive from time to time and any Member who shall be more than six months in arrears with the subscription shall not be entitled to vote at a General Meeting, receive a copy of any publication that is free to Members, nor attend any functions of the Association. (v) The financial year of the Association shall end on 31st March. (vi) A General Meeting may, on the recommendation of the Executive, confer the title of Honorary Life Member on any person who has rendered outstanding service to the School or the Association over a long period of years. The Executive may give consideration to any suggestion made by Branches in this regard, but no recommendation shall go forward to a General Meeting unless it has been approved by one meeting, and also confirmed by a subsequent meeting of the Executive. Officers and Executive Committee(i) Officers of the Association shall be elected at the Annual General Meeting and shall consist of a President who shall be elected (for a term of three years and shall be entitled to hold office for two consecutive terms) to office for no more than three consecutive years, a Vice President, a Secretary, and Treasurer (one person may hold both offices). (ii) There shall be an Executive Committee consisting of the President, the Patron, the Secretary and the Treasurer (one person may hold both offices), all of whom shall be Members, ex officio, and at least six, but not more than ten, who shall be elected at the Annual General Meeting of the Association. (iii) Only Old Boys of Whangarei Boys’ High School shall be elected to the Executive Committee. Five Members of the committee personally present form a quorum at the meeting of the Committee. The President shall be chairman of the Executive Committee. Nominations for the office of President shall be received by the Secretary one month before the date of the Annual General Meeting and the name of such nominees shall be circulated to regularly constituted Branches one month before the meeting and included in the formal notice of meeting as provided for in rule number seven. (iv) Branch Associations consisting only of duly enrolled Members, may be formed in the different centres of New Zealand or elsewhere and as regards policy generally shall be under the control of this Association and shall adhere to the same objects PROVIDED that no Branch shall be formed with an initial membership of less than five. (v) If a vacancy should occur on the Executive Committee owing to a Member’s departure from Whangarei, or failure to attend three consecutive meetings without leave of absence or excuse, or for any other reason, the Committee shall have the power to fill such vacancy until the next Annual General Meeting. (vi) The Patron of the Association shall be the current Headmaster of Whangarei Boys’ High School and shall be a member of the Executive Committee with full voting powers. Common Seal. The Common Seal of the Association will held by the Secretary and will be used only when authorised by the Executive Committee. When used it shall be signed by the President and one other appointed Committee Member. General and Special Meetings(i) The Annual General Meeting of the Association shall be held in Whangarei in the month of May, or as near thereto as possible. Ten Members personally present shall form a quorum for a General Meeting. (ii) A Special General Meeting of the Association shall be summoned by the Secretary on receipt of a requisition signed by not less than ten Members or upon a resolution being passed by the Executive Committee to that effect. (iii) Notice of both Annual and Special General Meetings shall be given by advertisement published at least one week prior to that meeting in a newspaper circulating in the City of Whangarei and such notice shall also state the business to be transacted at the meeting, and a copy of such notice shall also be sent in writing to all Branch Secretaries at least ten days before the date of such a meeting. (iv) Every Member present at a General Meeting of the Association shall have one vote and the Chairman shall have both a casting and a deliberative vote. A Member of the Association may vote at General Meetings by proxy, such proxy being in writing and being delivered to the Secretary or Acting Secretary at or before the beginning of the meeting. b) Interest on money lent at no greater that current market rates. Alteration of Rules(i) No alteration or addition shall be made to these rules nor shall any rule be rescinded except by a vote of a majority of Members present in person at such a Special General Meeting of the Association summoned for the purpose or by a vote of a majority of Members present in person at the Annual General Meeting. (ii) No addition to or alteration or recession of the rules shall be approved if it affects the exclusively charitable nature of the Association, personal benefit clause or the winding up clause. (iii) The provision and effect of this clause shall not be removed from this document and shall be included and implied into any document replacing this document. (iv) Notice of any proposed alteration or amendment to these Rules shall be given by advertisement published in a newspaper circulating in the City of Whangarei at least one week prior to the date at which such proposal is to be considered, and a copy of such notice shall also be sent in writing to all Branch Secretaries at least ten days before the date of such meeting. Termination of Membership(i) Members of the Association may cease to be Members upon giving notice in writing to the Secretary of their resignation. Such resignation shall take effect from the end of the financial year during which such notice is given, but without freeing such Member from any liabilities incurred by him as a Member of the Association before that date. (ii) Any Member whose subscription shall be unpaid for two years or upwards may be struck off the roll of Members by resolution of the Executive Committee one month after the passing of a motion to that effect provided that at least three month’s prior notice in writing of such motion shall be sent to such Member at his last known postal address. (iii) Where any membership is terminated the affected member has right of redress to the Executive Committee providing such redress is made within two months of the member being notified of their membership being terminated. If upon the winding up or dissolution of the Association there remains, after the satisfaction of all its debts and liabilities, any property whatsoever, then and in such case the same shall not be paid to or distributed among the Members of the Association but shall be disposed of for the benefit of the Whangarei Boys’ High School in accordance with the resolution of a majority of Members who may be personally present at a General Meeting called for the purpose.